WHAT IS LA VIOLETTE SOCIETA? There was a bit of a secret gig up on Hardman Street last night. Well, it was a secret… until Michael Head’s name slipped out on social media and tickets were suddenly as rare as a copy of ‘The Olde World’. What’s it all about? Introducing La Violette Società. By Graham Ennis. La Violette Società is a modern cabaret featuring music, poetry, visuals… magic perhaps. All with equal billing. It’s run by the people behind Violette Records – essentially Michael Head and a ragbag collection brought together by the website Shacknet. The first night of La Violette Società, at the Buyers Club on Hardman Street, featured poet Paul Birtill, The Blue Soul and a singer songwriter billed as Joni O’Shea. Ticket sales were light until it clicked that Head had written a short story under the pseudonym Joni O’Shea and then it sold out in minutes. So it came to pass that over two hundred people crammed into that long room – with sight-lines worse than the Lower Bullens – to watch the old grump poet, Paul Birtill. I missed him, unfortunately, but was assured he was excellent. So is his book, a collection of poems. Buy it – he’s as miserable as sin and funny as hell. Next up came Mick. Sobriety suits him – fit and healthy, he looks twenty years younger. A musical Benjamin Button. Moreover, after decades of abuse, his voice is developing a real richness. At times here, he positively crooned. He even hit high notes not heard since Shack’s ‘Zilch’. The crowd lapped it up. 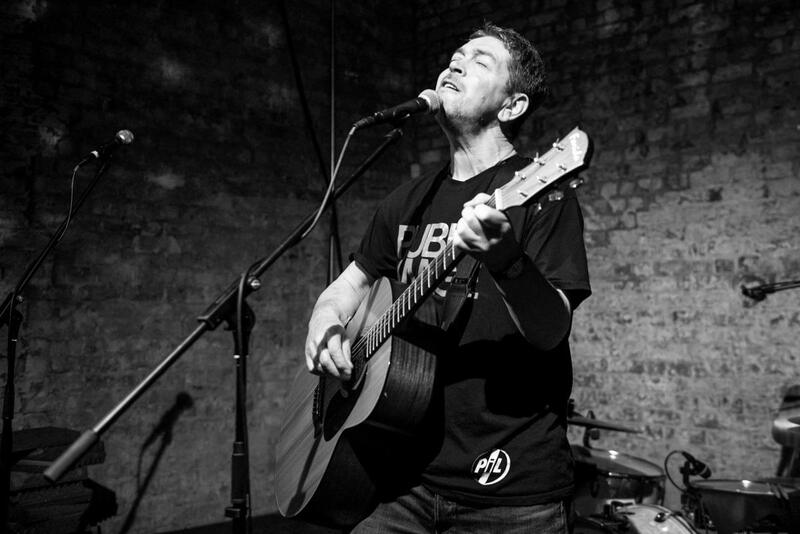 Liverpool has a deep-seated love for Michael Head and his music. I can’t help thinking that that devotion is about to be rewarded with a remarkable late-period renaissance. That kind of goes against the ethos of the Società. Then again, it’s a new idea and hopefully people will get the hang of it. Eventually.